Roll out the red carpet, blow the shiny, loud horns, wear your fanciest dress (you too, men) – guess who’s back? Yes, I am still alive. Yes, Jonny has been keeping this blog afloat for a year now. And yes, I am ready to try to blog again. After a year of figuring out how to be a parent (and how to be comfortable being a mom and finally coming to terms with the fact that my life will never, ever be the same again) and learning to balance everything that comes with this new, crazy world, I finally feel like I want to write again. And what could be better to write about than the grapevine that not only GREW in the soil of our Brooklyn, NY, yard but even FLOURISHED and provided over 20 lbs of sweet, delicious Catawba grapes? Many of you may have never heard of Catawba grapes before and until researching how to use the grapes for jam, neither had I. One factoid I did learn is that it is a native grape, discovered in 1802, mostly an east coast varietal and is used to produce some wine. I was amazed at how incredibly sweet the grapes were and figured the wine made from them would probably be some sort of dessert wine. 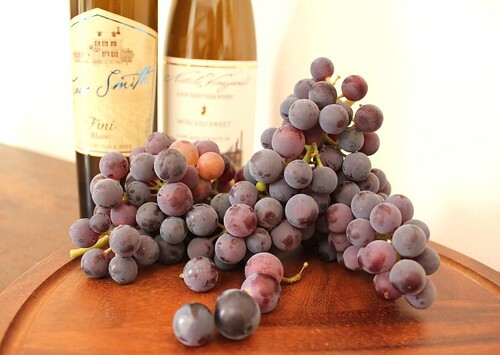 In fact, the Catawba grape is responsible for the first American sparkling wine. I thought it was pretty cool to know that little old USA has native wine-growing grapes (in fact, there are about four types of native grapes). In the mid 1800’s, Catawba sparkling wine was even lauded by many experts in Europe (one person shockingly wrote it was better than anything that came from the Rhine!). The Finger Lakes region in upstate New York still uses this varietal to make much of the wine produced there. As you’ve probably read in earlier posts, our garden bounty has been enormous this year and our two grapevines growing against a beautiful Brooklyn chain-link fence did not disappoint. Never having worked with home-grown grapes before, I realized that they could be used to make delicious jam. After de-skinning (by hand!) 4 pounds of them and making 5 jars of delicious grape jam, I needed something else. We found this wonderful recipe for a sweet flatbread in a Tuscan cookbook and I knew that I had to have it. It was incredibly easy to make and worked well with our morning espresso. If using fresh yeast, mix with sugar in medium bowl, then whisk in 1 cup of warm water. Set aside for 10 minutes until frothy. For dried yeasts, use according to the manufacturers instructions. To make the yeast dough, sift the flour into a large bowl and make a well in the middle. Pour in the yeast mixture along with the egg yolks, olive oil and salt. Mix together until the dough comes together. Top out onto a lightly floured surface. Knead for 10 minutes until dough is smooth and elastic. The dough should be soft but not too soft. If it gets too soft, add a bit more flour and knead. Place in a clean, oiled bowl, cover with a damp kitchen towel and let rise until doubled in size – about 1 hour. Meanwhile, make the walnut butter by creaming the butter and sugar together with the lemon zest, then stir in the walnuts. Keep at room temperature. When the dough has risen, knock the doughin the middle. Shape into a ball, flatten and roll out into a rectangle to line the jelly roll pan. Line the the jelly roll pan with the dough and then spread with the walnut butter. Top with grapes and dust with some sugar. Cover with a damp cloth and leave it to rise another hour or until puffy and doubled in size. Welcome back Amy…great return with this sweet flatbread. Glad you’re enjoying your garden. Welcome back Amy! You are a wonderful mother and an awesome cook & blogger. This sounds great and something I would really like. I may even have to try it. The picture looks so yummy. BTW, we know about Catawba grapes bec. that is the name of our street, in a development called “The Vineyards”. I make a grape focaccia that I love… what a lovely change to try this recipe… a little different! How remarkable to have your own grapes in Brooklyn. My neighbor has some here… but didn’t see any this year! I don’t know much about indigenous grapes… shame on me. Catawba makes a very sweet wine… do they taste like concord? I’ve probably had them without knowing. Welcome back to the blog… Jonny has done a great job holding down the fort! Welcome back Amy and though your life will never be the same now that you are a mother, you are in for a great time with your little one. Thanks for this post and the history of the Catawba grape is fascinating. 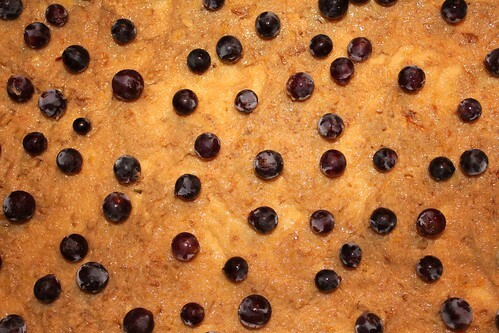 I make this and call it “Schiacciata con l’uva”….for the Etruscan grape harvest……it is so different and delish. 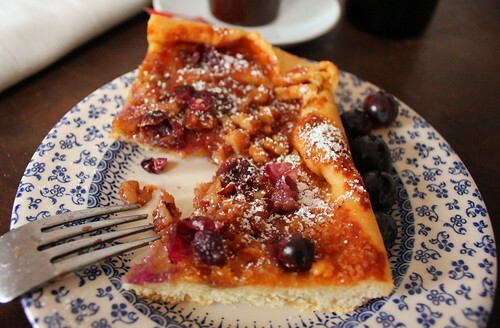 Sullivan St. Bakery makes a type of pizza with champagne grapes, fennel seeds and dusts it with sugar, it’s my favorite! Welcome back and congratulations! For baby AND grapes..I would never have imagined a grapevine in NY. The flatbread…? 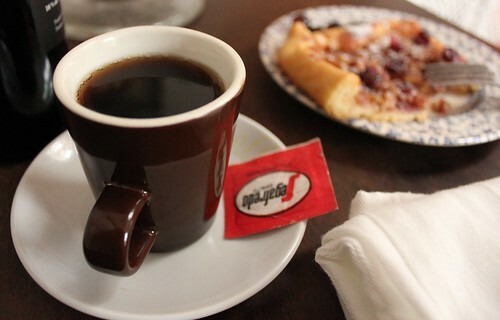 Can I have coffee with you? Nice to hear your voice Amy. We all know how busy you’ve been. That photo of the flatbread with espresso is so compelling. I would wake up early for that breakfast. thanks, lori lynn. much, much appreciated! Welcome back to the blog world! Good to see you Mommy. Thanks for the lesson on local grapes (and the chuckle about a beautiful chain link fence). I love grapes, but not raisins, and while raisins are used often in sweet foods, grapes are totally underused unless they’re made into jelly. Thanks for getting the world out of a fruit rut! Hey, welcome back. I have to go pick grapes at a friend’s house to make jelly. We got 25 lbs. last year. My La Pavoni is being repaired in Brooklyn, so I’m extra mad about that pic with the coffee.